After resigning his commission in the US Navy, J.N. Maffitt took a commission in the Confederate Navy and served as the commander of the privateer Florida. 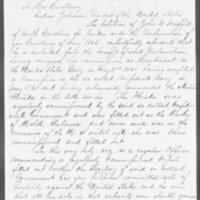 Maffitt explains that he never waged war on the United States, yet insists that he treated all prisoners under his control were "treated with kindness, humanity, and indulgence." 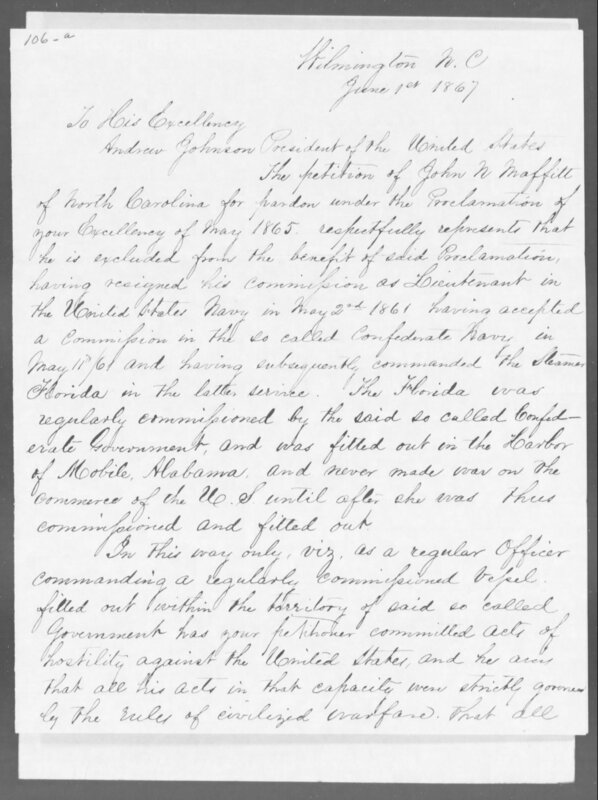 John N. Maffitt, Amnesty Petition, June 1, 1867, Case Files of Applications from Former Confederates for Presidential Pardons ("Amnesty Papers"), 1865-67, Records of the Adjutant General's Office, 1780s-1917, Record Group 94, Publication M1003, National Archives, Washington, D.C.
John N. Maffitt, Amnesty Petition of John N. Maffitt, June 1, 1867, Civil War Era NC, accessed April 24, 2019, https://cwnc.omeka.chass.ncsu.edu/items/show/477.